Nutmeg is the dried seed of the fruit of an evergreen. Sweet and highly aromatic, organic Ground Nutmeg is especially good in combination with other sweet spices like cinnamon, cloves and allspice. Use it in baked goods, or add a dash to applesauce, eggnog and custards. Great in savory dishes, too, such as in Greek entrees, cooked spinach, potatoes, cheese dishes and cream sauces. 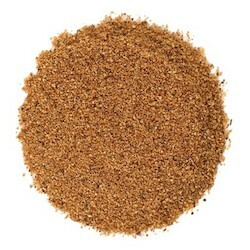 Our organic bulk ground nutmeg is kosher certified and non-irradiated.